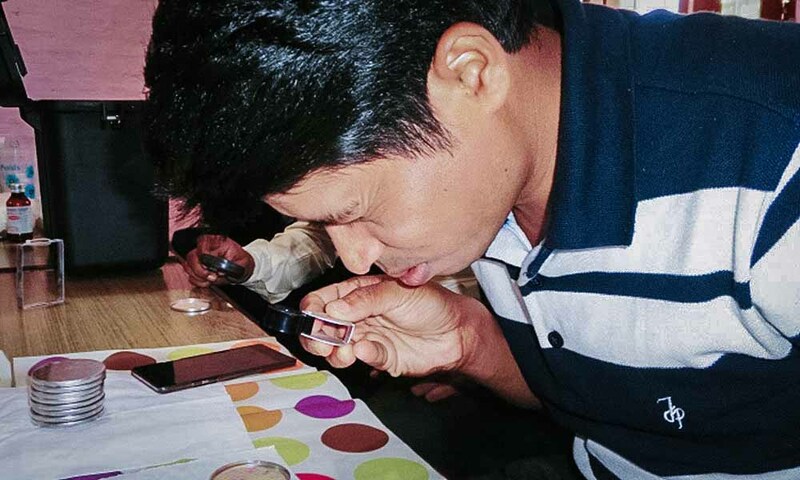 INF recently facilitated a two day Drinking Water Quality Testing workshop in Dang, as part of the Water, Sanitation and Hygiene [WASH] programme being carried out in the Rolpa District, Mid-Western Nepal. The goal of the programme is to provide access to clean drinking water and practical knowledge about sanitation and personal hygiene in order to improve health and the quality of life in three communities of this district. The workshop was held in Dang to allow participants to come together for training from each of the three communities where the WASH programme is underway. Globally each day approximately 2,000 children under five years of age die from diseases caused by contaminated water, lack of sanitation or inadequate hygiene. The workshop trained the participants in testing techniques of vital parameters that should be analysed in order to identify if the water in the new water schemes is of good quality. For example, microbiological analysis of E. coli bacteria is important to see if the drinking water might be contaminated with faeces from humans or animals. The workshop was followed by a field visit to the Hangpal drinking water project located in Seram, Rolpa, where water quality analysis was undertaken. An inauguration of the water scheme was also held and the community celebrated with music and dancing. The field visit was joined by two representatives of funding partner organisation Water for All from Sweden. PRAY | GIVE| GO | SHARE – Please thank God for our staff and local partners serving in these remote communities to provide better health and improve the quality of life.